Veteran director Ivan Reitman says the knee-jerk nature of social media, and our politically correct times, makes producing edgy content more challenging. Reitman, the man behind Ghostbusters, Stripes and Kindergarten Cop, notes how sites like Twitter pounce on artists when they share less popular opinions. Reitman’s newest film could only offend fans who think their favorite team made the wrong deal back on May 8. Draft Day, available now via Video On Demand and Pay-Per-View and on Blu-ray Combo Pack Sept. 2, follows a GM (Kevin Costner) trying to dramatically improve his team. Costner’s Sonny Weaver gives up plenty for the first pick on draft day, but is he done dealing yet? Or is it his career with the Cleveland Browns that’s done? “I always believed making a straightforward dramatic film is easier than constructing a successful comedy,” he says of the project, which still showcases his flair for comedy during some stressful sequences. 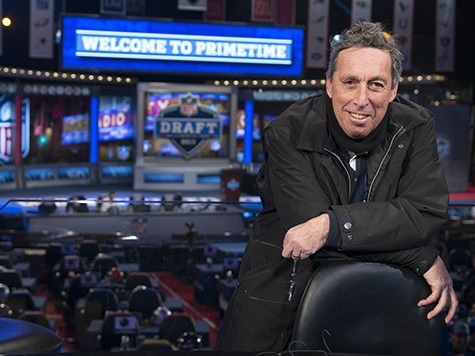 Draft Day certainly suits Reitman’s leading man, an actor gaining gravitas after a long run on the A-list. “He’s just a naturally intelligent actor, and person, by nature … he’s learned a lot and directed a number of times,” says Reitman. Costner’s character takes heat not just from his boss (Frank Langella) but from a legion of Browns fans eager for a Super Bowl appearance. Reitman could relate to those expectations. Few current directors could match Reitman’s resume, or even come close. He still can’t rest on his film laurels. The industry “tends to think people over the age of 40 are washed up,” he says. Anyone needing a refresher course in what Reitman can do need only look at the 30th anniversary release of Ghostbusters in theaters now. The director just rewatched his 1984 comedy classic and found the film’s number one reason why audiences are still lining up to see it. “It has a very positive, optimistic nature even though it’s ironic and hip. That hipness holds up today,” he says.